"15th century painter Cennini spoke of the art of 'unseen things hidden in the shadow of natural ones.' Like 'a sea turning in on itself' Kate Buckley's poems speak to this, moving together, folding and unfolding the echoes of a voice in place, a voice out of place, 'salt licking salt--/coming home. 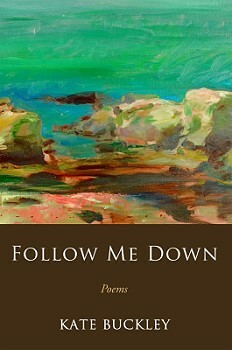 'Follow Me Down maps out the geography of longing where sometimes 'you walk the yellow fields,' sometimes 'the moon sets itself on fire,' lighting up the distances between the past and the future. Buckley's parenthetical considerations, her ache and intellect coincide in a sensuous, revelatory motioning toward that inspired sanctuary of who we are." the slap she dealt you. (as if you deserved it). (with nowhere to go so it stays). with nowhere to go so it stays. And you do not meet her eyes. you walk the yellow fields home. the left blue, the right brown. and still so much yet to write. sometimes I count every crack in the ceiling. Sometimes the moon sets itself on fire. Sometimes I want to join it. from that slender deck sloped over the sea? and we ducked inside to the quiet dark of this new thing begun. the hushed slush of the waves splash-crashing to shore. anchored beneath my head and you woke me, singing.